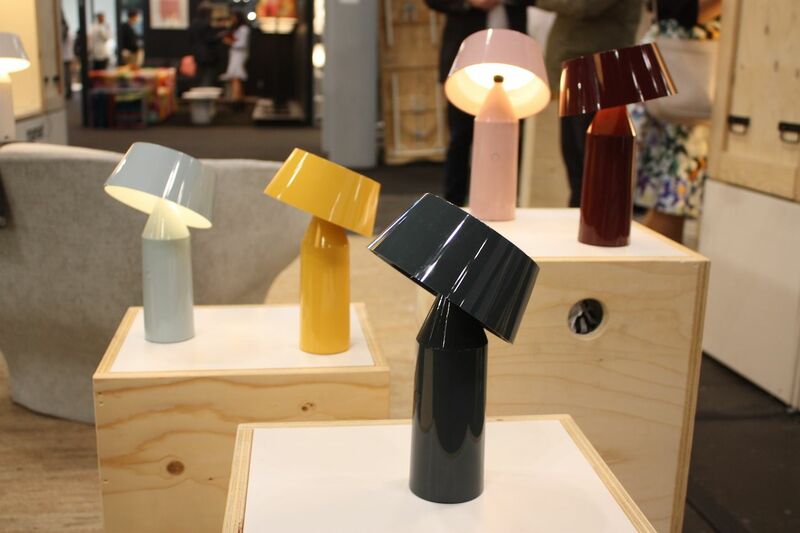 Getting to see all the contemporary lighting fixtures is one of the best parts of the International Contemporary Furniture Fair and there was much to see in the 2017 edition. Glass, wood, metal porcelain paper and concrete could all be found in the latest new designs. 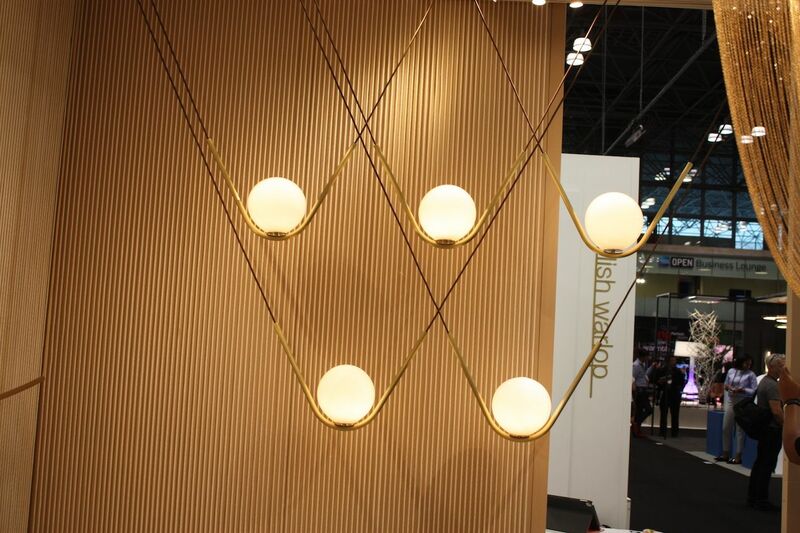 Here we bring you 50 of our favorite lighting fixtures from ICFF 2017. The Lotus is available in 20 different veneers including White Linen, Maple, Cherry, Wenge, Birch, and Zebrawood. The metal finish comes in brass, nickel, bronze or copper. 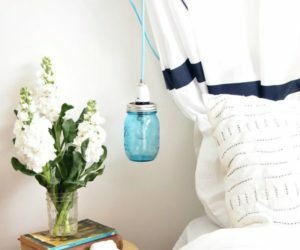 The Dandelion is a really playful fixture for those who appreciate modern, unique designs. The pendant is available in three sizes: 8, 12, and 16 inches. Based in Porto, the Portuguese company makes high-end contemporary pieces that are inspired by nature. Barcelona is a fixture n the creative realm thanks to its many designers and artisans. The pendant comes in two sizes. 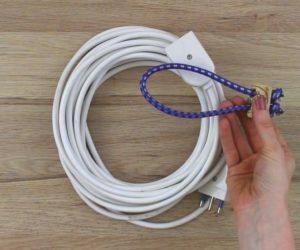 The company also produces accessories for the home and for electronics. 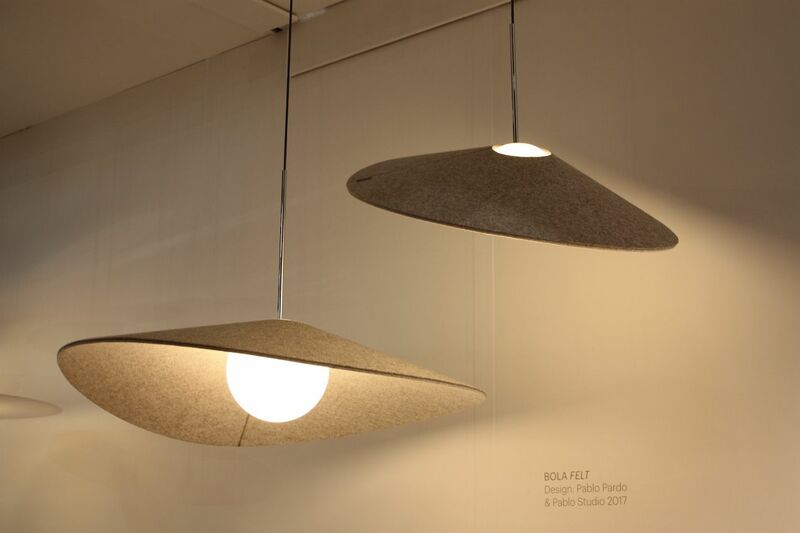 The Bola Felt by Pablo Pardo is a stylish round bulb topped off with a slim felt shade that that is very chic. 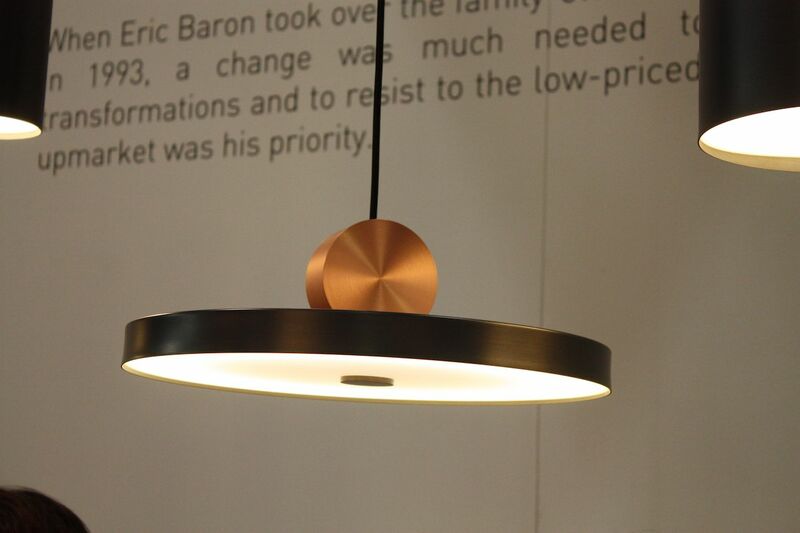 The hat-like shade can be tilted in all directions, allowing the user to direct the light specifically. Created in 2017, it is a casual design that has a great deal of flair for a minimalist design. The Bola is perfect for a wide variety of space. 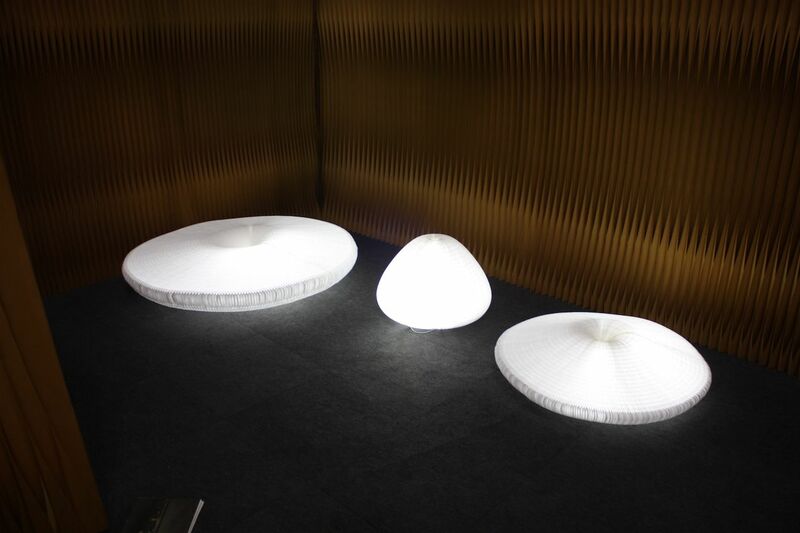 Molo’s Urchin Lights are one of the coolest things ever. The accordion style paper material that Molo uses for all of its products has been transformed into a glowing light fixture that can morph into other shapes. As you pull and twist the light, it undulates into other shapes. It can also be taken apart and folded flat since it is illuminated by a single LED light source. The urchin light comes in three sizes. 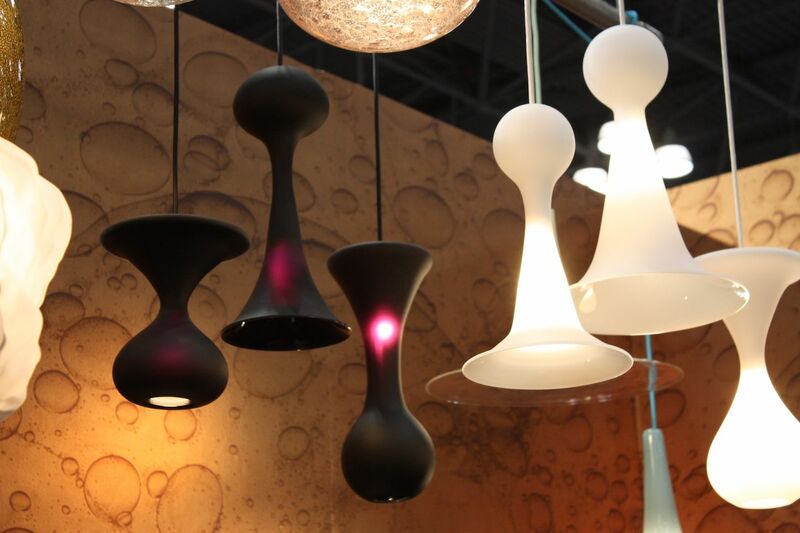 Slim ceramic pendants from Pidgeon Toe ceramics feature saucers and spheres that give dimension to the fixtures. Founder Lisa Jones makes her ceramic creations, which go far beyond just lighting, in a Portland, Oregon workshop. Using brass hardware to highlight the matte finishes on the ceramic fixtures gives them a distinctive look. 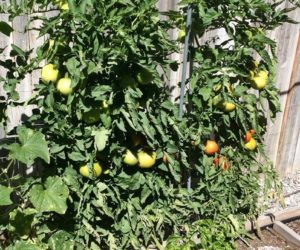 Although they look great alone, we love them in a grouping. 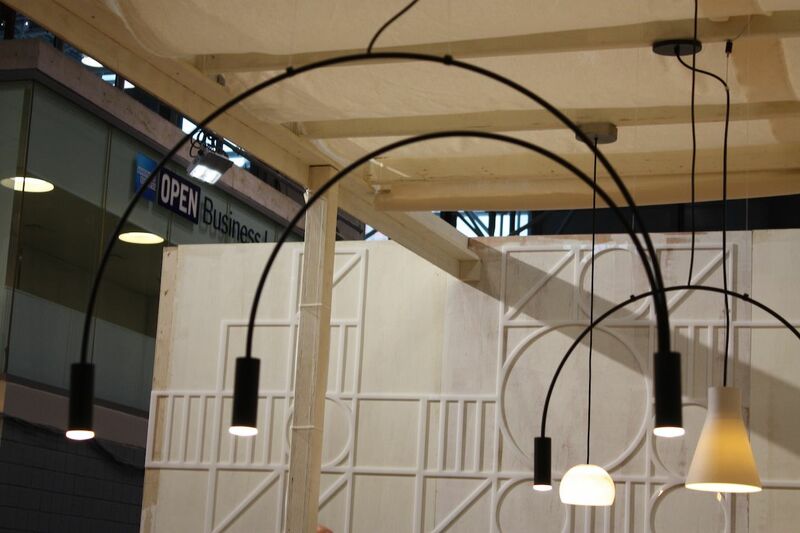 Jones says these pendants bridge the gap between lighting and jewelry. 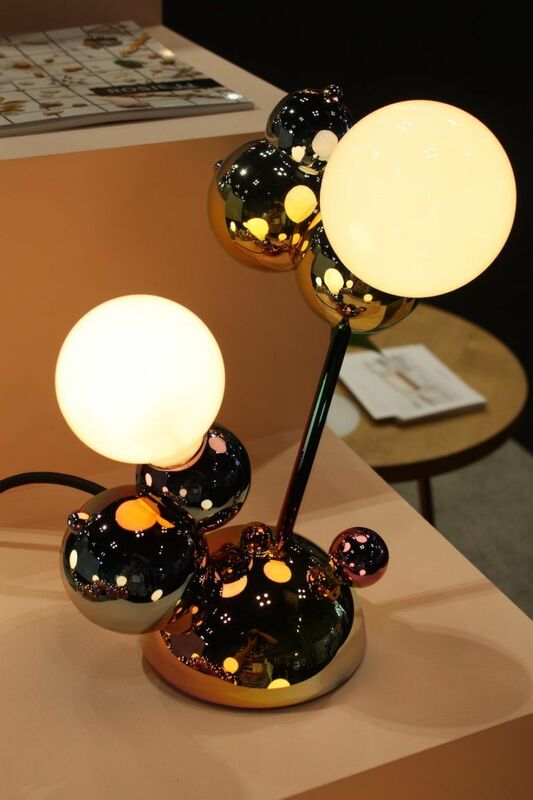 It’s no wonder these Bubbly Lights from Rosie Li draw attention — they were inspired by soap bubbles and stir up a sense of fun and wonder. 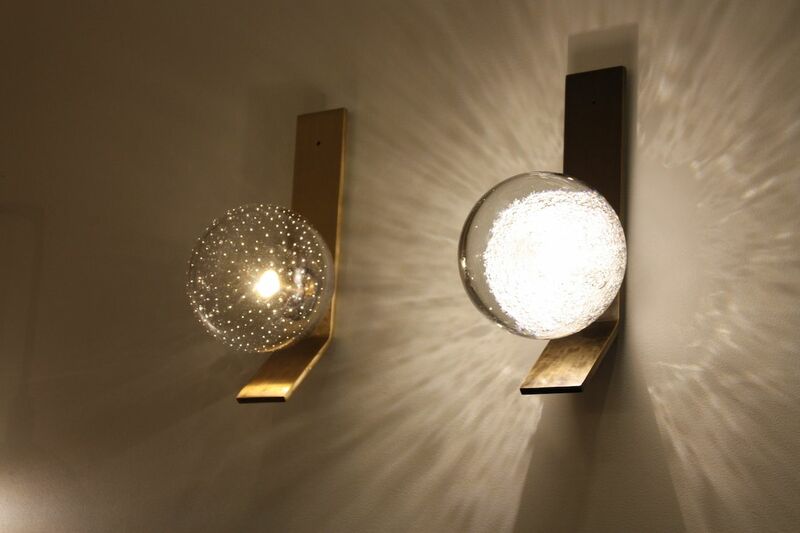 Available in different finishes, Li writes that the lights are an ” exploration of the forces of attraction and other cluster patterns found in nature.” Regardless, they are shiny and stylish, and cast a wonderful light that would brighten up any space. Botroiydal hematite was also an inspiration for bubbly. The Bubbly collection is available as table, wall or ceiling fixtures. Simeon & Salazar has been creating blown glass pieces for nearly 20 years on California. The craftspeople aim to meld the tradition of Muranese glass and the balance and restraint of the Scandinavian designs. The result is stunning pieces like this wall sconce that loos spectacular in a grouping, creating a feature wall in any room. The light pattern that is cast on the wall is especially nice. 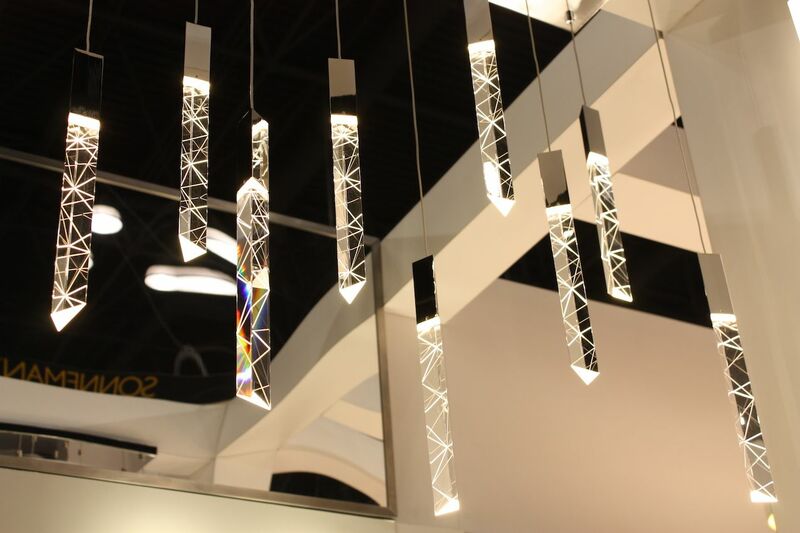 Like glowing stalactites, these gorgeous pendants are from Sonneman. The Trinity pendant is made from cut crystal and polished chrome and the LED at the base highlights the geometric scoring on the glass. 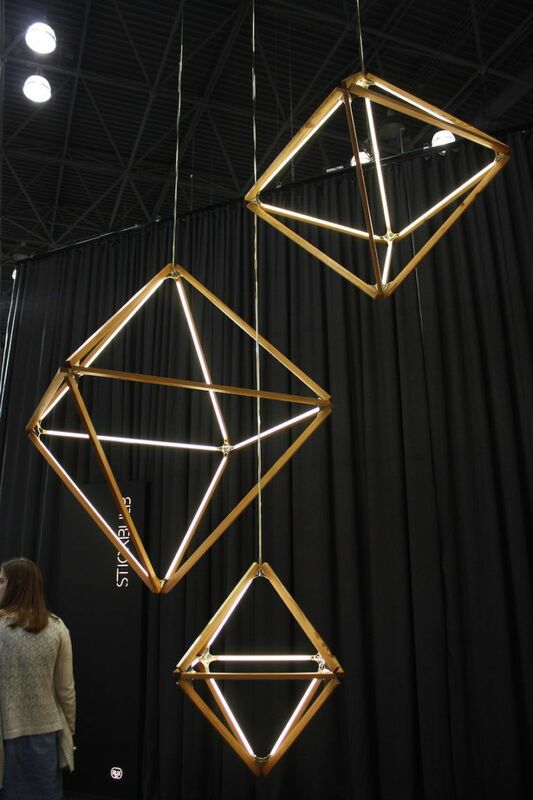 Like daggers of light, these pendants would be perfect in a modern or comtemporary space. They are dimmable and cast a warm white light. 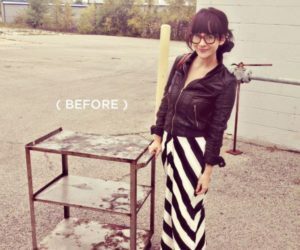 The upstarts behind Souda have been forging a strong name for their brand in the less than five years the company has been in business. They design accessories, furniture and lighting, like this Signal Arm Sconce that is a modern take on mid-century modern. 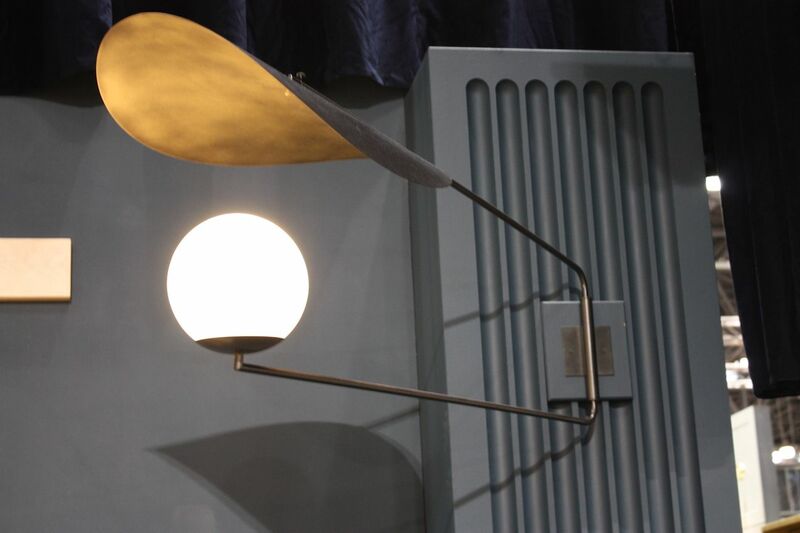 The cantilevered arm rotates, allowing the light to be moved as necessary. The rose gold tone is very on-trend. The LED fixture is made from aluminum, steel and acrylic. 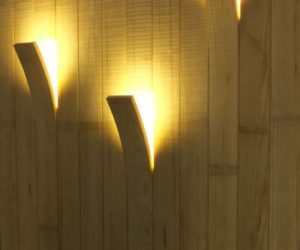 The undulating fin wall system behind these lights from Standard and Custom is as interesting as the lights themselves. The company is a custom design and fabrication firm that offers complete services, but focuses on digital fabrication. The wood construction of the HARU lights is precise and distinctive, allowing light to project from all sides of the tubular fixture. Much like true seaglass, these tumbled bits of glass have an opaque, translucent quality. Designer Steven Pikus of South Africa has transformed the pieces in to this phenomenal Fire and Ice chandelier. 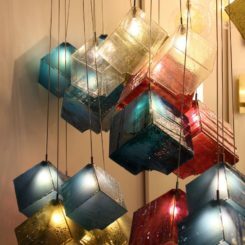 Each piece is wrapped with wire and suspended from a metal frame, creating a soft jumble of light-diffusing component. 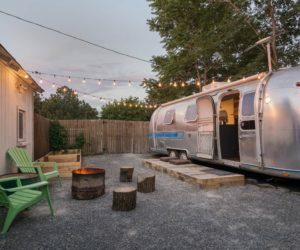 Pikus is known for his fixtures made from upcycled diesel engines. The fresh design was presented by wakaNINE of Austin, Texas. The fixture size is fully customizable. 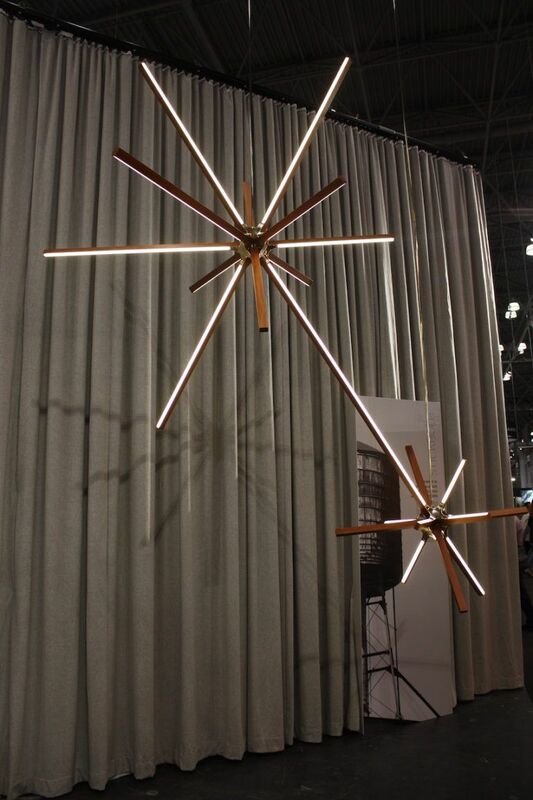 The Boom Chandelier by Stickbulb attracted a lot of attention, as their products usually do. The chandelier is an evolution of their early stick lights that were among the first. With the boom, the designers have created a burst of light by having a central core made of brass with the varied-length sticks pointing outward like spikes. 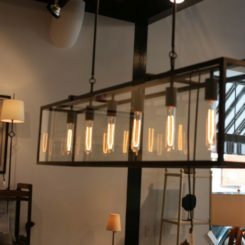 While the chandelier is available in different wood options, one of the most exciting is this one created with redwood reclaimed from old water tanks. The Boom is also available in this larger double fixture. Stickbulb’s Single Diamond is also a favorite. Part of the X Collection, it is inspired by shapes in nature like hexagons and tetrahedrons. This fixture is also available in different sizes and wood choices. 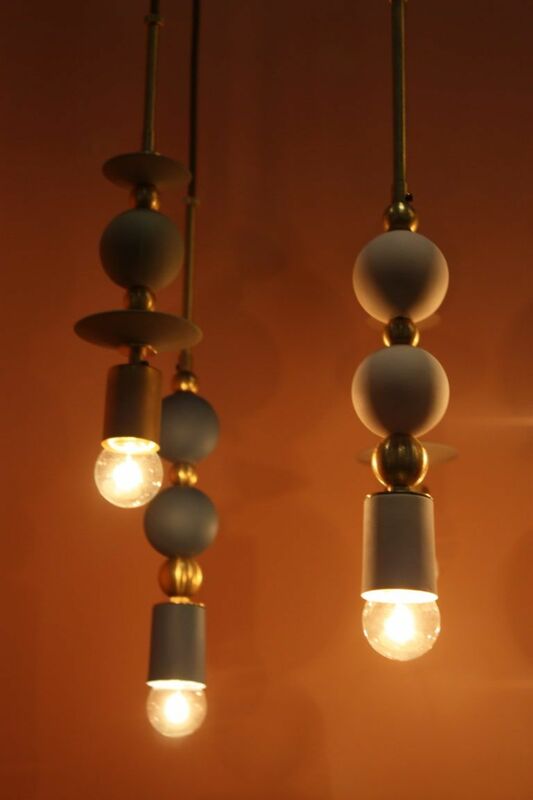 Tala’s Voronoi II Bulb is featured in this set of pendant fixtures. 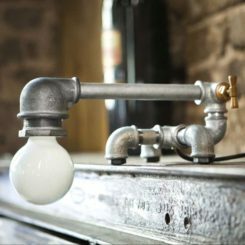 The British company’s elegant, organically shaped bulbs that feature a unique lighting element shape, are warm and natural looking. Unlike chandeliers that project a colder, white light, the softer light that emanates from these golden bulbs provides a very warm and inviting ambiance. Tala plants ten trees for every 200 products they sell. 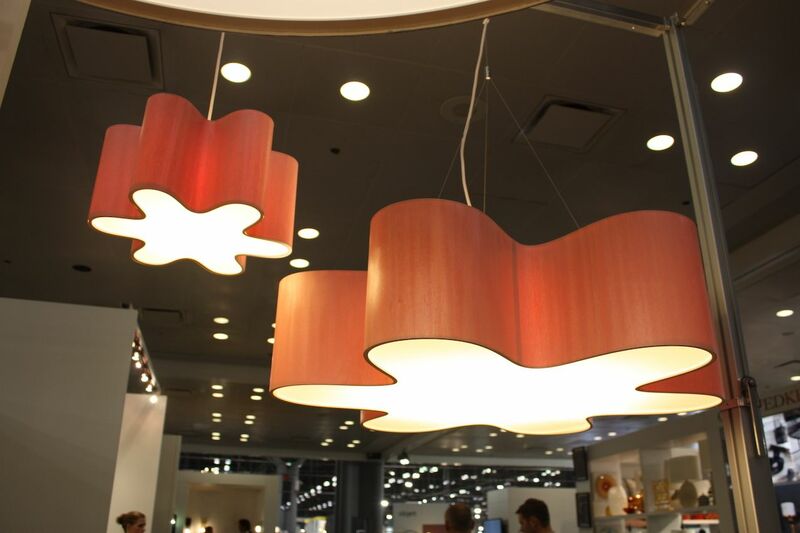 Tightrope’s lighting concepts this year included this stunning Lotus Canopy light. Formed from porcelain, the flat shades on the LED lights evoke lotus leaves floating on a pool of light. The translucence of the material, as well as the ridges and ripples in the paper thin edges give the light a very interesting quality. This is a fixture you can really appreciate from directly underneath. The design of the individual pieces is beautiful. 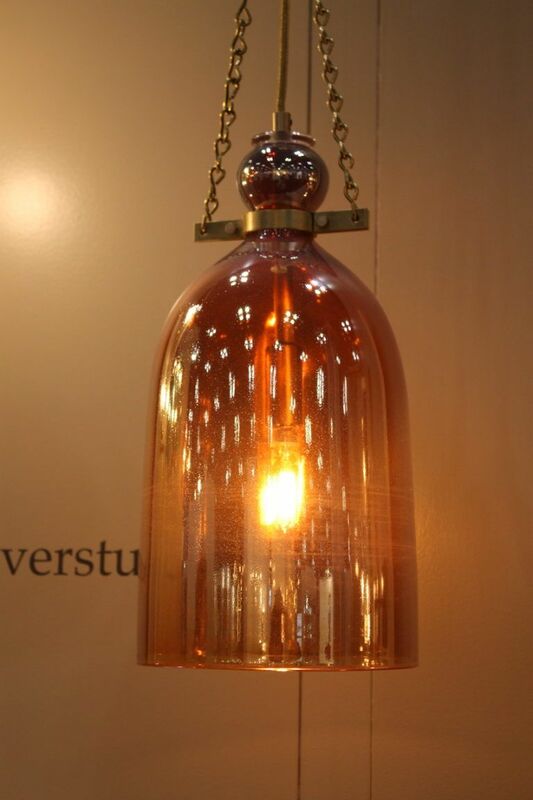 Already fans of lighting by Tracy Glover Studio, we found more to like, such as this Cloche Sconce, that Glover says was inspired by Roman glass and antique Mosque lamps. The chains are common in those lamps but are a novel addition to a wall sconce. Although it’s available in 29 different colors, we adore this hue for the warm aura it gives. The metal is available in seven different finishes. 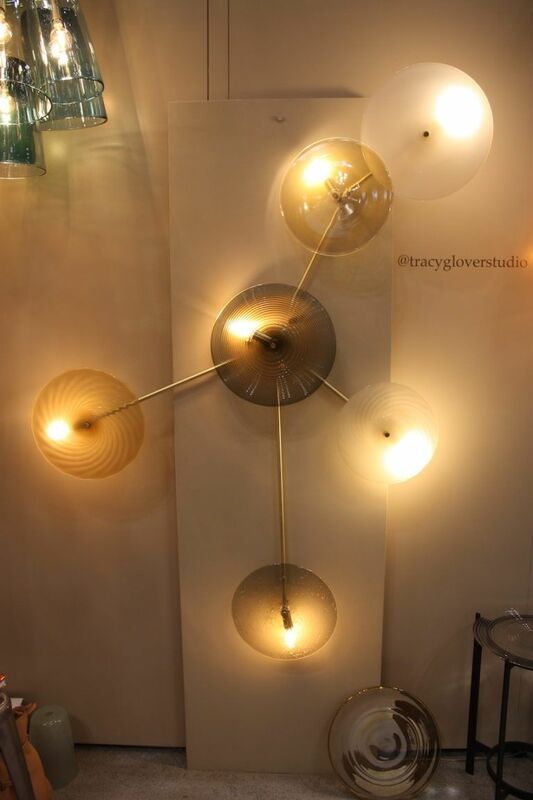 This pick is also from Tracy Glover and is a fun and futuristic wall sconce. 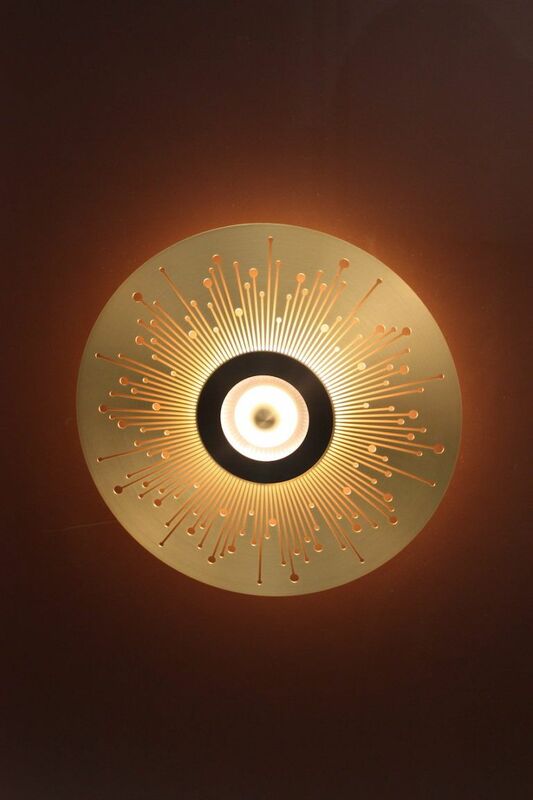 The central disk features the Wrap pattern with its thin glass threading (also used in her Rondel sconce) while the others have different patterns and textures. The fixture has a planetary feel. Veronese is a French luxury lighting house that has a long history of producing spectacular Murano glass lighting and mirrors. 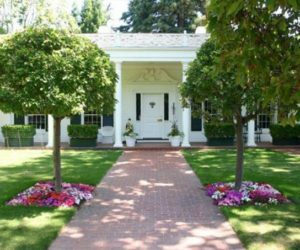 We have three picks from this design house. 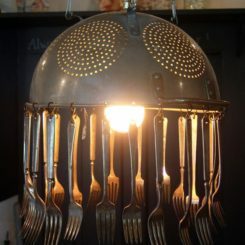 This is literally a gem of a lighting fixture. Called Bijoux Bijoux the blown glass shape can be combined with different finials that make it look like an elegant jewel ready to dangle from a necklace. Placement of the light source at the top is also novel and adds to the appearance of a jewel. The fixture was designed by Laurence Brabant. Designed by French architect, artist and designer Patrick Naggar, this is Cell. A number of Naggar’s collections have focused on a scientific subject. He has rendered his version of a cell as this elegant shape, that is almost somewhat reminiscent of a bone. 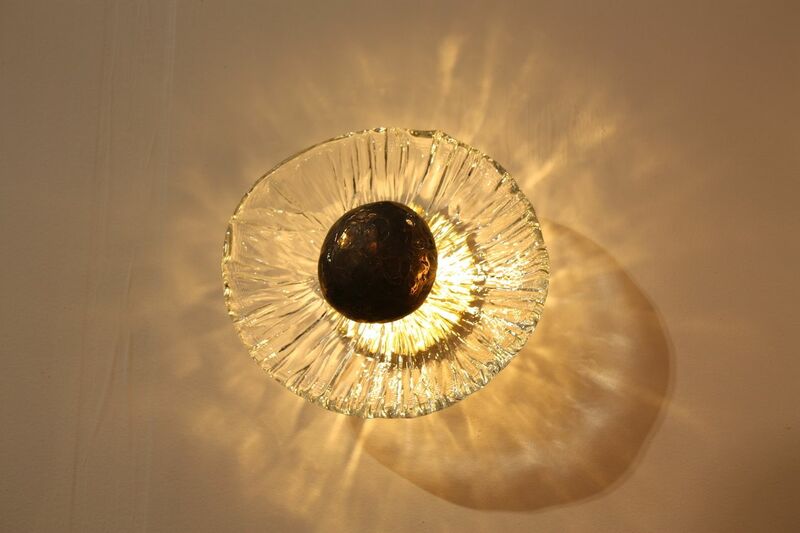 The outer wall of the cell is the blown glass and the lighting element is the nucleus of the fixture. Cell comes in four glass colors. 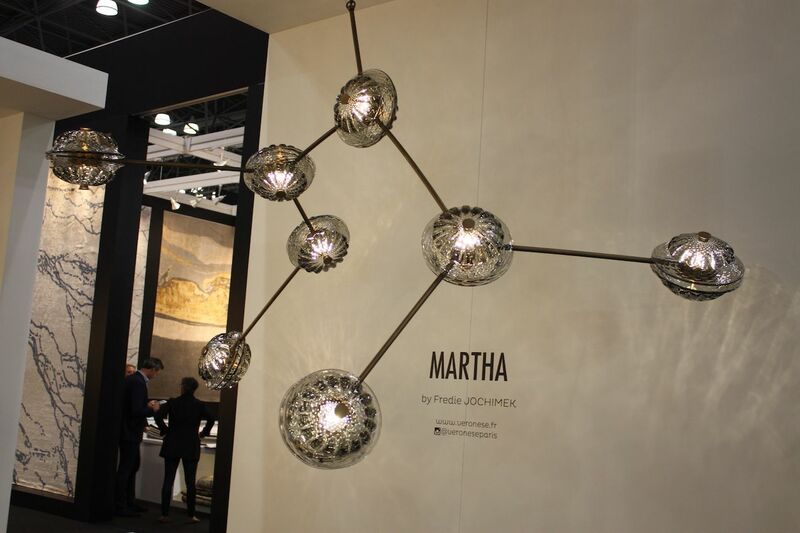 Completely different from the other two, Martha is designed by Fredie Jochimek, the president of Veronese. The design features cups and bobeches, two elements of classic Murano chandeliers, that have bee overlooked. According to Veronese, the cups traditionally used for the bottoms of chandeliers to cover the inner workings and bobeches were for catching melting wax. Jochimek features these forgotten elements in his new contemporary design, where the metal arms can be placed in a number of directions. The modular fixture’s arm structure is customizable. 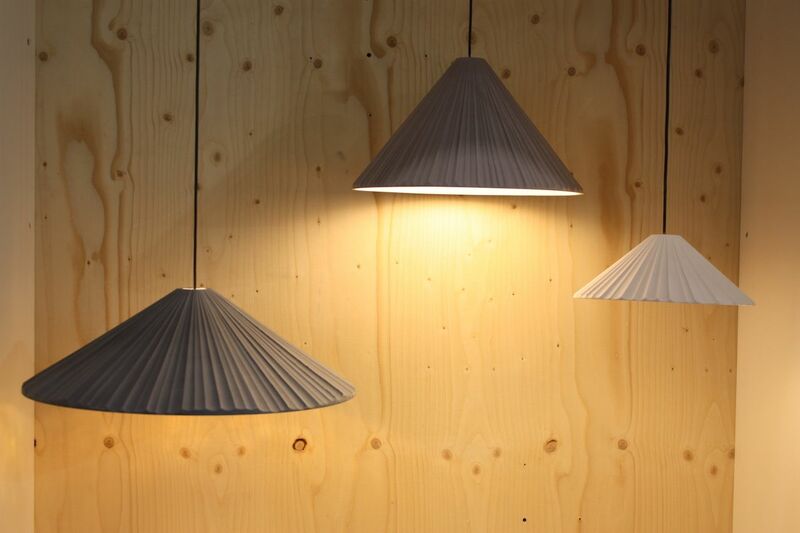 Here you can see the cups and bobeches and how they are used in the fixture. The Eos shade from VITA Copenhagen is like an ethereal floating cloud. 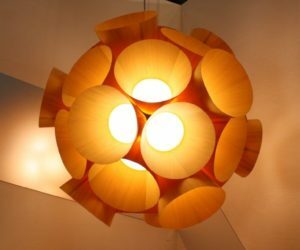 It can be used on a table or floor lamp base, or as a pendant. The company uses recycled materials and uses by-products for new purposes. The goose feathers on this shade are reclaimed from the food industry, so instead of being burned, they are sanitized and used for the lamps. VITA also puts everything in flat packaging that is more efficient and less wasteful. The feathers are hand stitched for the fixture. 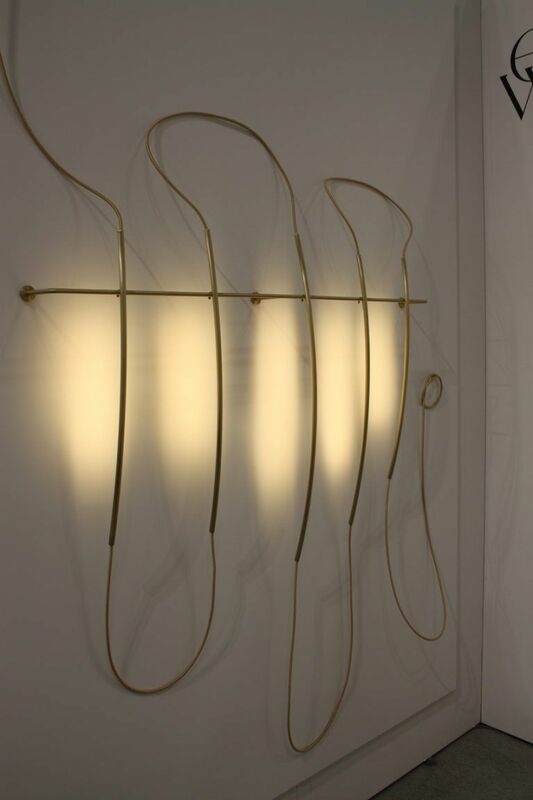 Elish Warlop Design Studio created the fun and funky Line Lamp, which is made up of curved brass tubes all connected by a fabric cord. Slots in the back hold LEDs that shine on the wall and all the bars can move. The fixture as a whole looks like a loopy line drawn on the wall. The size of the piece is also customizable and can have as many tubes as you like. Warlop likes to “explore the paradox of motion within stillness” in her work, leading to simple works that are more complex the closer you look. 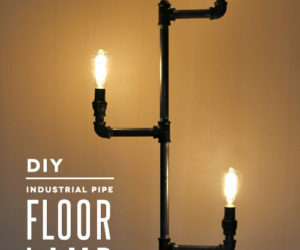 This casual and different lighting fixture is interactive. Martin Huxford creates his bespoke lighting in a Sussex, England studio. 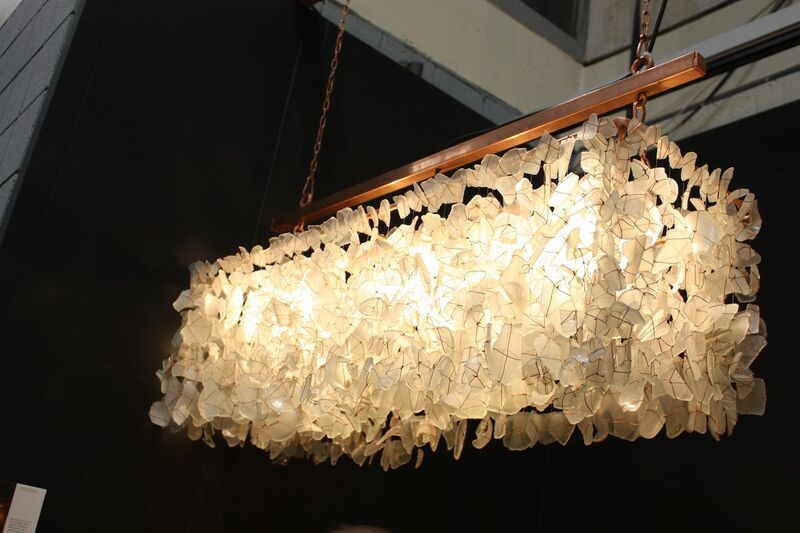 His pieces tend to all be quite contemporary or modern but this one has a touch of old fashioned nostalgia thanks to the shape and texture of the mouth-blown crystal shades. 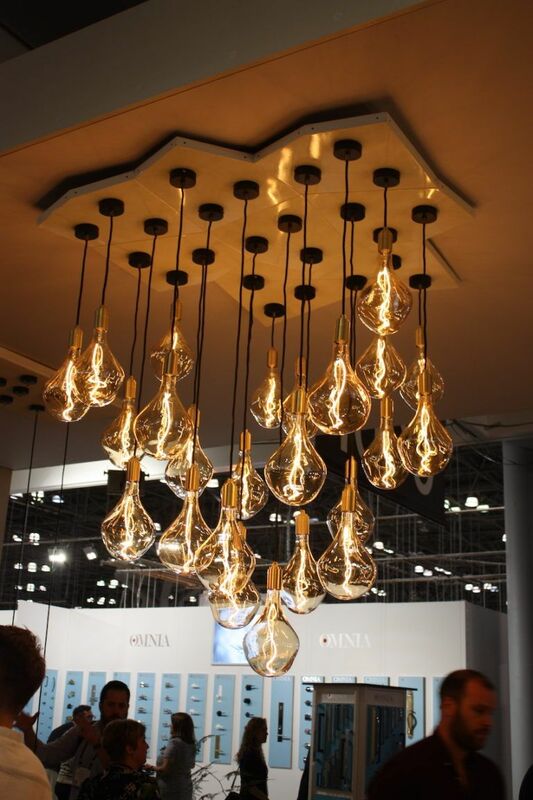 The shades are the same shape as the designer’s Lily pendants but here are amassed into a modern chandelier. 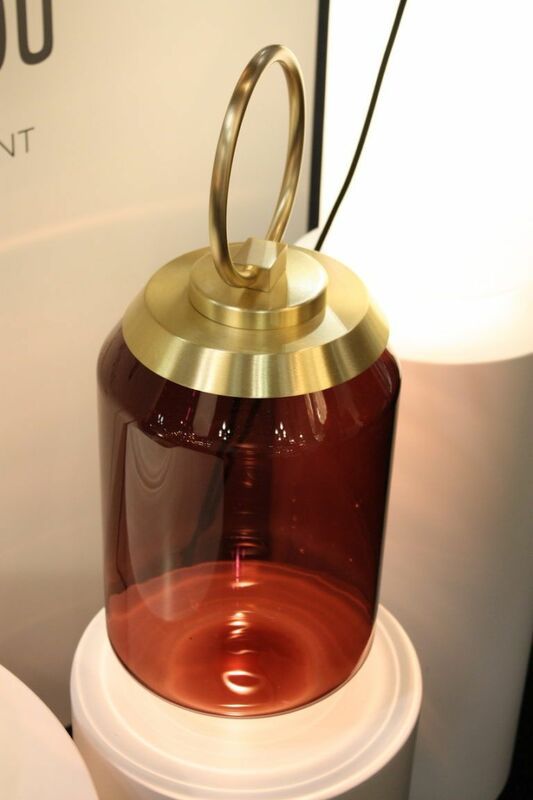 The rick tone of the glass contrasts wonderfully with the ample brass base. Marset, a Spanish company founded in the 1940s, always has some alluring new designs and we found two favorites this year. The first is Pu-erh, by Xavier Mañosa. 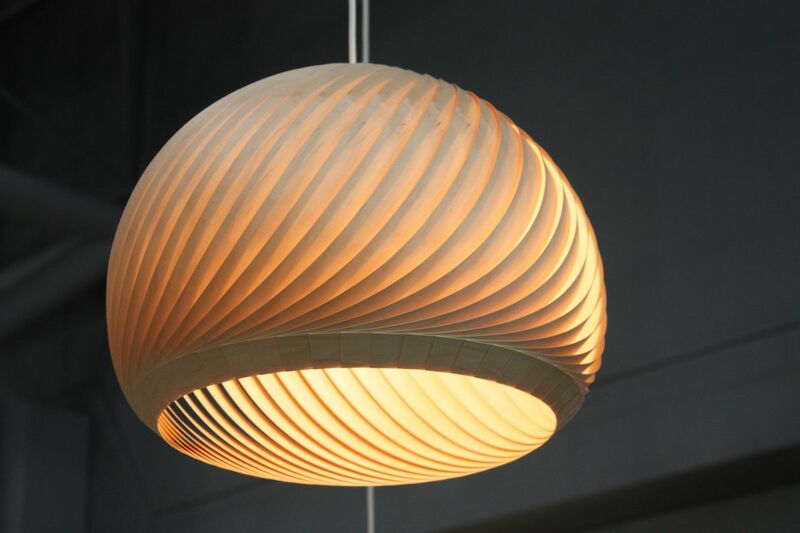 What looks like a pleated silk shade is actually a ceramic design that focuses on a natural, unpolished feel. Named after a highly sought after Chinese tea variety, it has the same earthy yet refined feel of that beverage. 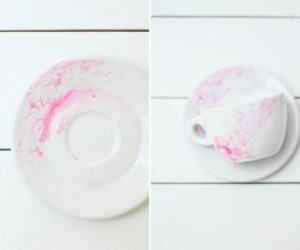 The ceramic lam is available in black, white, green, blue and salmon. Once speakers went wireless we knew it wouldn’t be long before lighting followed and the the number of designs and models available is quickly growing. 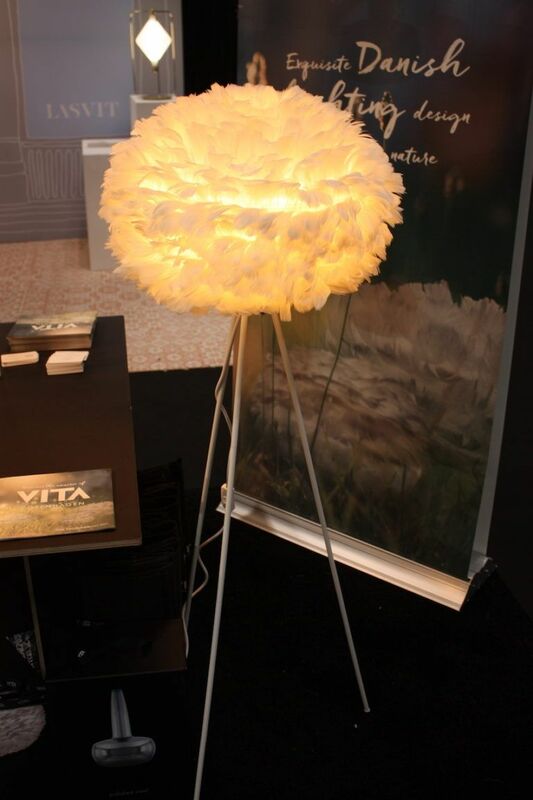 This is the Bicoca lamp by Christophe Mathieu. 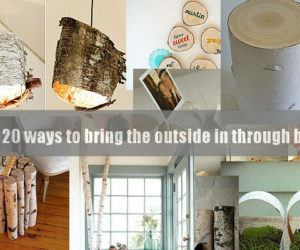 Rather than having a lamp in a fixed location, you can take it with you wherever you go in the house. 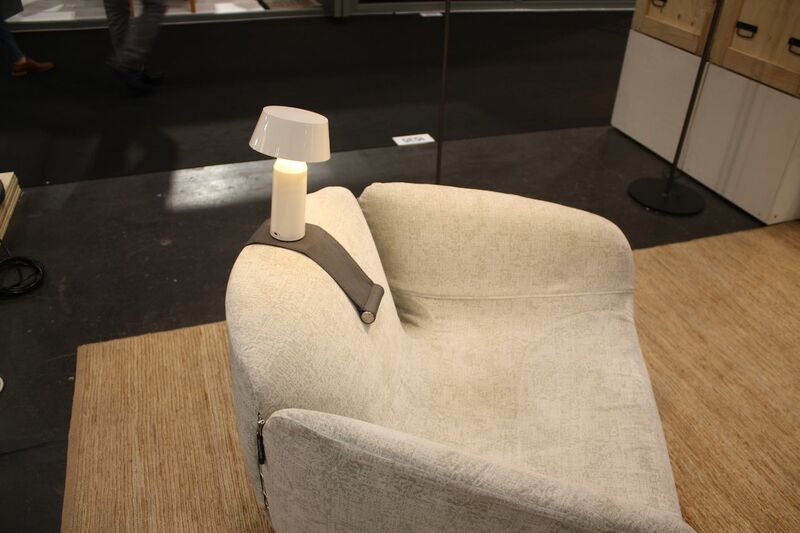 Want to sit in your favorite armchair and read? 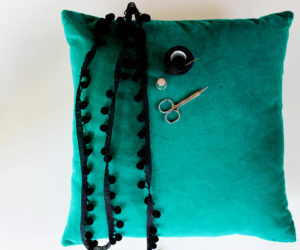 Take it with you, attach it to a weighted overlay, and drape it over the arm or back of any chair. It’s lightweight and the swiveling shade makes it functional in any spot. The colorful choices are also a lot of fun. The Bicoca is made of polycarbonate. It’s stylish from any angle. The functionality is greatly increased with the overlay, which allows it to perch anywhere without tipping over. We fell in love with a number of fun and funky pieces by LZF this year at Salone del Mobile, but we keep coming back to this versatile and stylish suspension light called the Swirl. Designed by Irish designer Ray Power, it comes in a variety of colors and two versions. 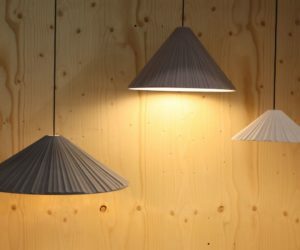 The Spanish company hand-creates amazing wood veneer lighting fixtures using their special techniques. 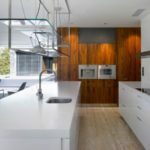 Using natural wood veneer, artisans fuse it to a malleable material that allows them to create fixtures with sinuous curves that puts out light with a warm and cozy quality. 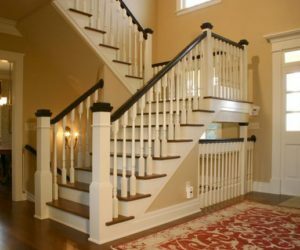 Although many colors are available, the fixtures with a natural finish are among the loveliest. 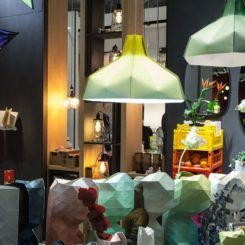 LZF’s Dandelion light is a more offbeat design that comes from a decade-long collaboration with designer Burkhard Dämmer. The LED circuits are completely hidden away the varying cup sizes only serve to emphasize the fixture’s relation to the poofy springtime stem of fluff. 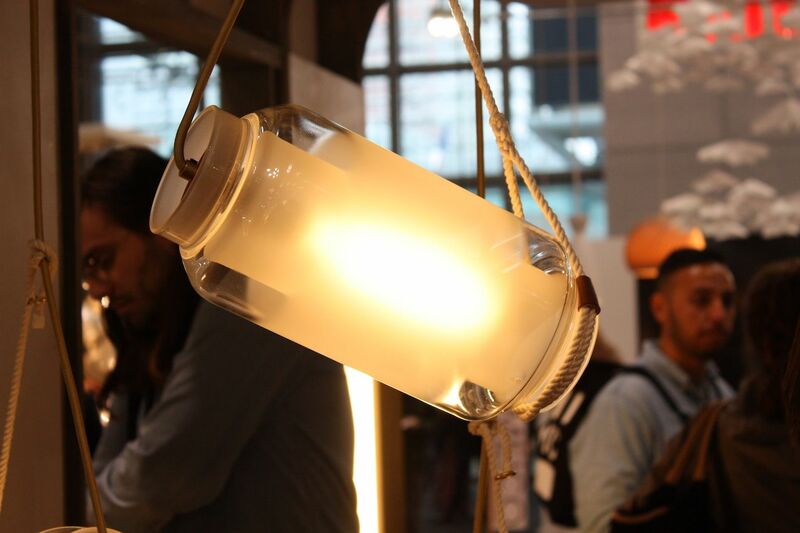 This luminous lamp from Lights Up of Brooklyn, New York drew our attention thanks to it’s iridescent inner shade. While the inner shade is shiny and a bit disco-esque, the grid pattern plays down the bling and adds a bit of an industrial feel. The entire fixture is then softened with the addition of the sheer, outer shade. 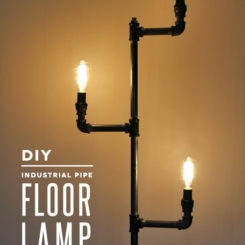 This lamp, like all pieces by Lights Up is made by hand in a Brooklyn factory. 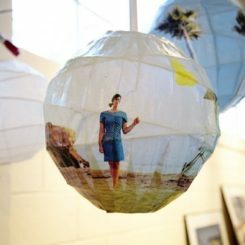 The company’s lampshade options include fabric made from 100% recycled PET (plastic bottles) for its exclusive print patterns. 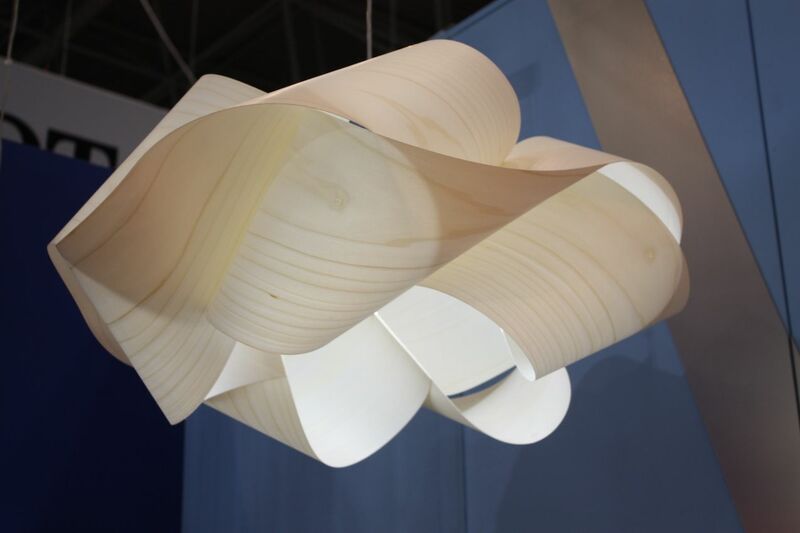 Lampa’s Lotus Pendant drew our attention partly because of the fixture’s ample width, combined with the curvy profile. The light just glows through the wood veneer, adding to the beauty of the piece. Located on the East End of Long Island, New York, the company is going on nearly 30 years of design and production, following a commitment to sustainable design. Montreal Studio Larose Guyon showed this installation of its Pearl pendant, arranged in an overlapping manner. 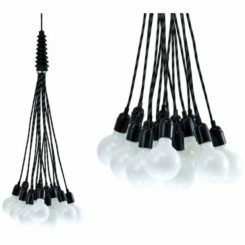 The stunning single pendant can be combined to create an aggregate fixture that is as large or small as a customer desires. The two founders say they are inspired by art, nature, past periods and traditions. 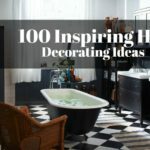 Wherever they get their vision, the result is elegant and glamorous fixtures that don’t have a lot of extraneous frou-frou. 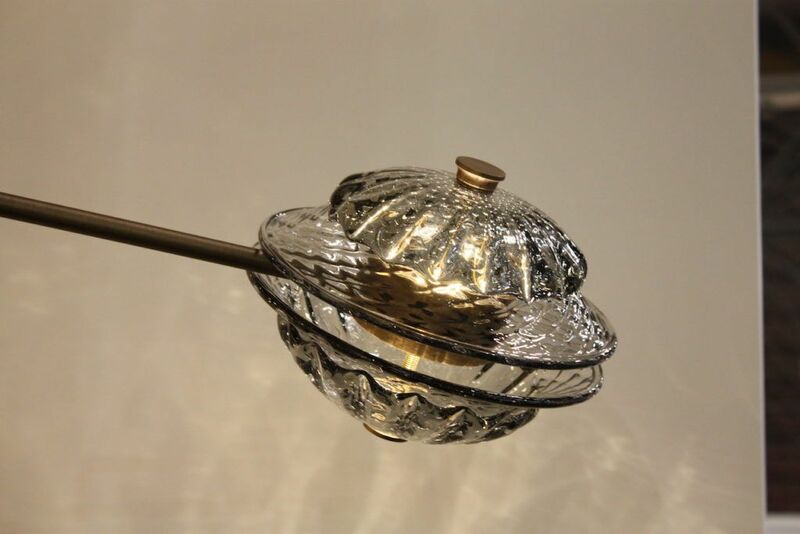 The eight-inch hand-blown ball rests on a metal fixture that is available in a copper, brass, black or nickel finish. 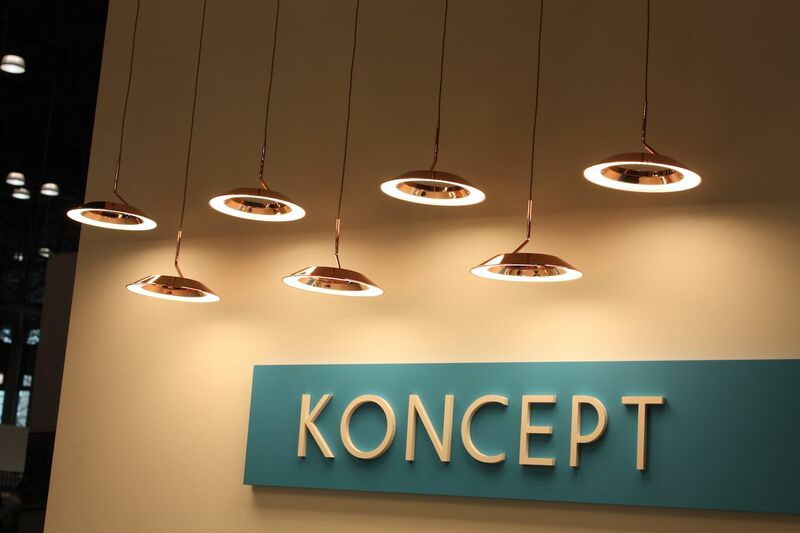 Also elegant but at the minimalist end of the spectrum is Koncept’s Royyo Pendant. The absence of a visible wiring system helps keep the look clean and spare, but the rosy gold finish is warm and elegant. These are great used singly but we love the effect of a grouping like this one. It was designed by Kenneth and Edmund Ng. 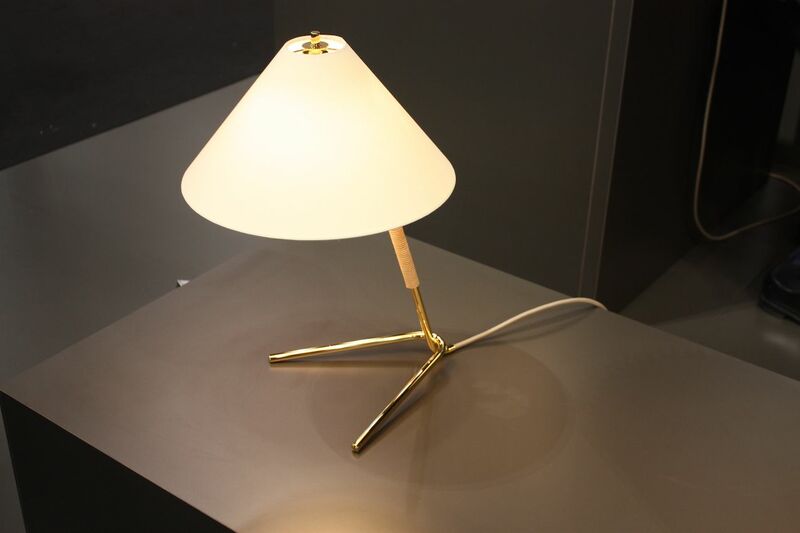 Royyo is also available as a floor or desk lamp, which also has an integrated USB charger. The simple bent tube that supports it and leather grip make it a versatile piece. Essentially the same profile, but a totally different look is Kalmar’s Billy lamp. 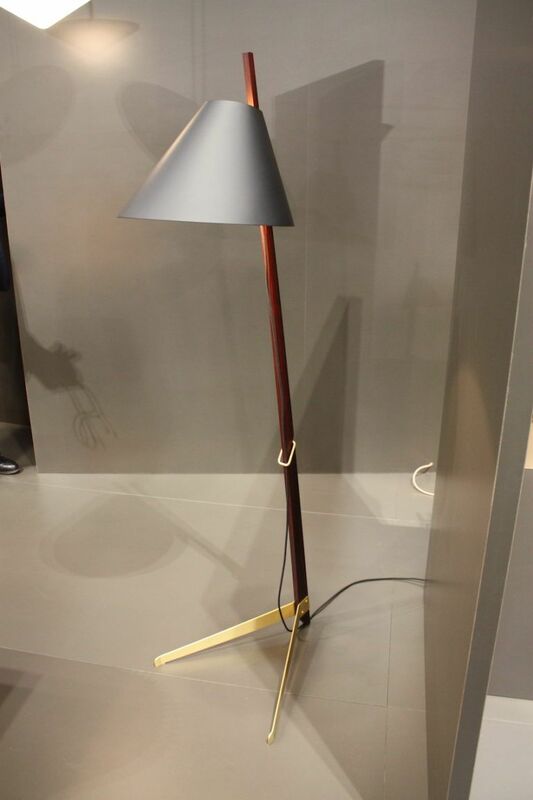 With the addition of a wood pole and more substantial metal components in various colors, the floor version of this fixture is more modern than the Hase Lamp. A bit industrial, the piece features wood that is in stained, but finished with a clear coat. 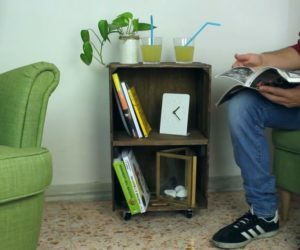 The Billy lamp uses only wood and four metal components. 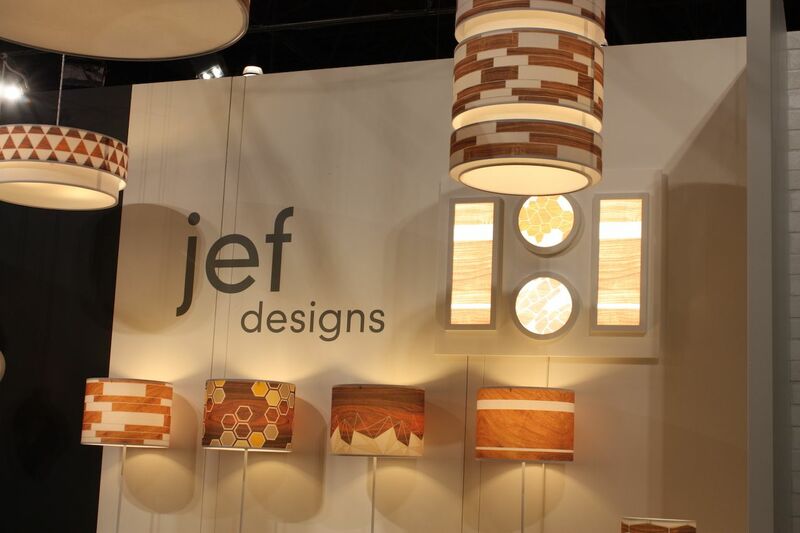 Another riff on wood veneer shades — sort of — are these by jefdesigns of Portland, Oregon. 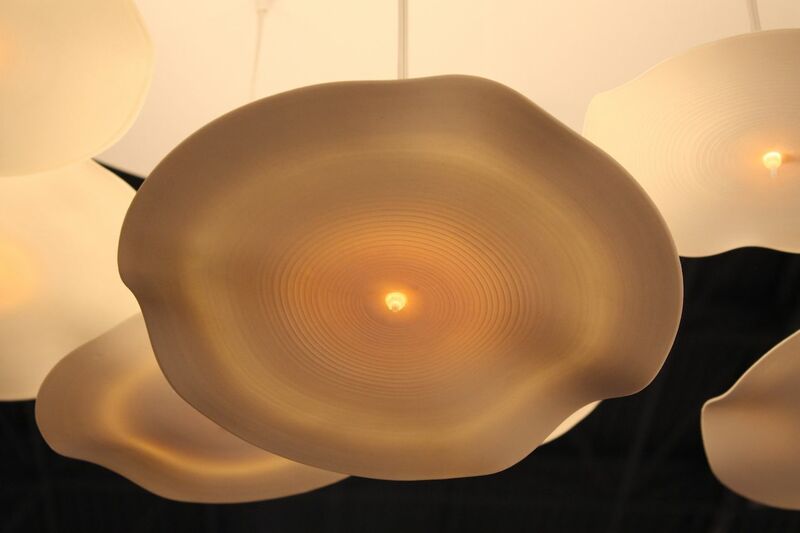 The company creates fixtures that are inspired by patterns in nature. The shades are a different technique that layers digital wood grain on linen. Designer Joe Futschik creates them all and they are produced by artisans in California. An attractive array of patterns is available for pendant, table and floor fixtures. 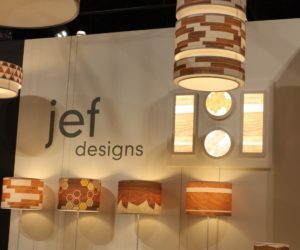 Jefdesigns also makes lighted wall pieces like those shown here. Futuristic yet elegant, the award-winning Pearl wall light by Ginger and Jagger could grace so many different rooms in a home. Crafted from marble and metal, it plays on the unique qualities of a pearl — rarity, magnificence and serendipity. The hand-carved base is marble and the central orb is metal. The design really does evoke the feeling of having popped open an oyster to find a spectacular gem. 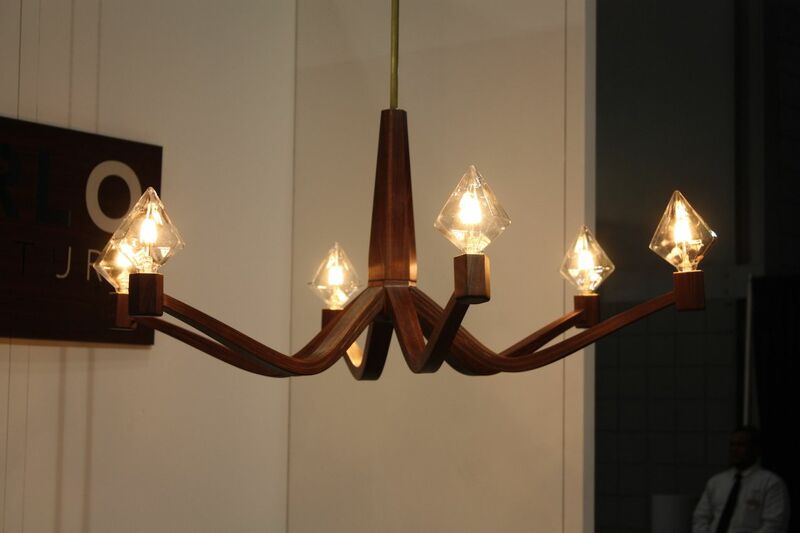 This hand-crafted wooden chandelier from Giancarlo Studio Furniture is angular and different. Designer Giancarlo Paternoster uses his background in mechanical engineering and love of craftsmanship to create furnishings — as well as lighting — from beautiful wood. He uses a variety of novel techniques he has developed, along with established processes to create his pieces. This chandelier has substance thanks to the ample wood sections, but is still sophisticated, made even more so with the gem shaped bulbs. Exacting joinery techniques enhance the elegance of his pieces. 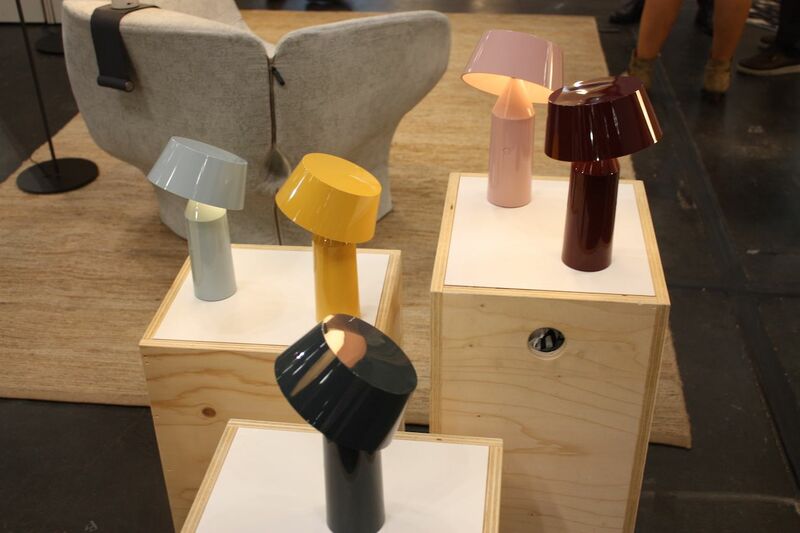 A bit unusual, but actually quite fun is this capsule light, called the ISP, from France’s DCW Editions. Lift up the end of the capsule and the lighting element slides out along the track, letting you control how much light you want. More for an accessory for ambiance than functional lighting, there are no switches or knobs involved. The tube of light comes on as it is pulled from the interior. The piece was invented by Italian-Russian designer Ilia Sergeevich Potemine. This piece is more like a torch, that you want to grab and go. Esque Studio yielded some great picks as well. 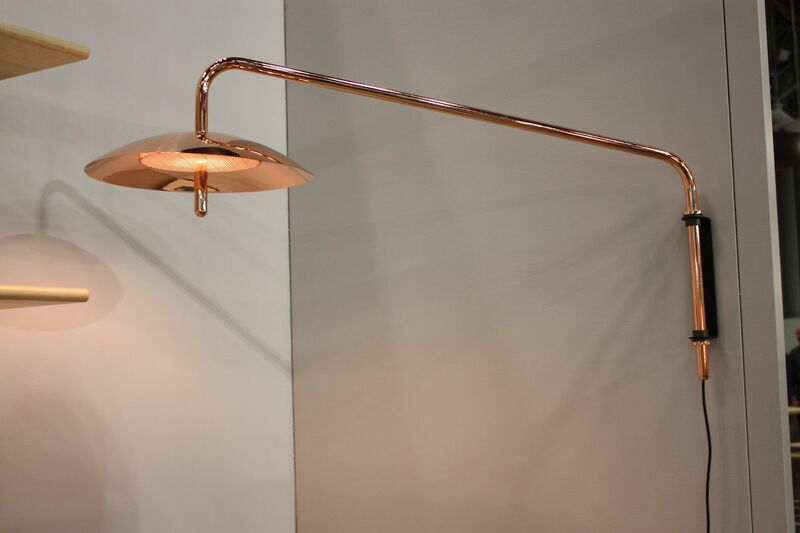 This Liaison Lamp was a collaboration with Harry allen, who combined metal plates that are cut with water jets and a mouth blown glass shade that is blown directly into the metal plate. 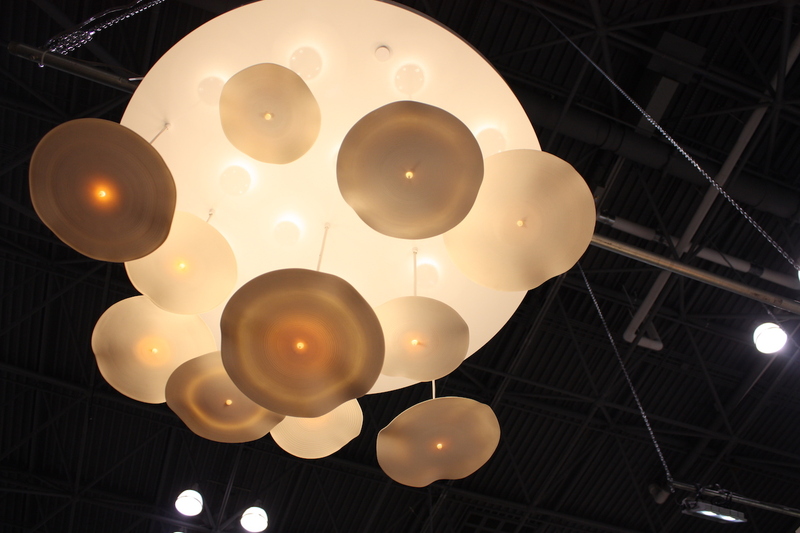 The resulting trapped bubble make the fixture a wonderful combination of art, lighting and accessory. The clear glass shade has a satin finish. The studio’s moody and dark Flatlander series was said to be inspired by “desolate landscapes and silhouettes of water towers.” Matte black glass and the vivid magenta hue from the light inside yield a very dramatic look. The similarly shaped white fixtures don’t provide the same level of drama but are delightful pendants in their own right. The dark version of the series provides some serious drama to a space. 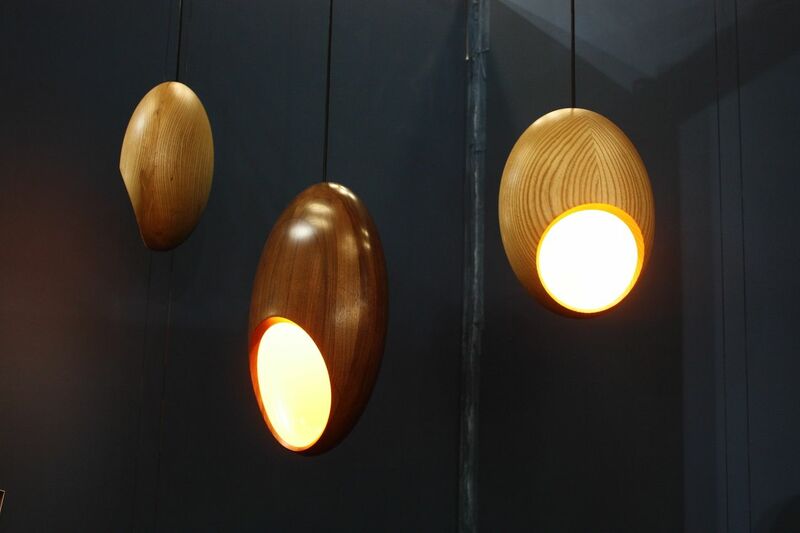 Donald Baugh’s wooden lighting is natural and modern at the same time. We have always loved how he pairs the natural wood exterior with a vibrantly hued interior. 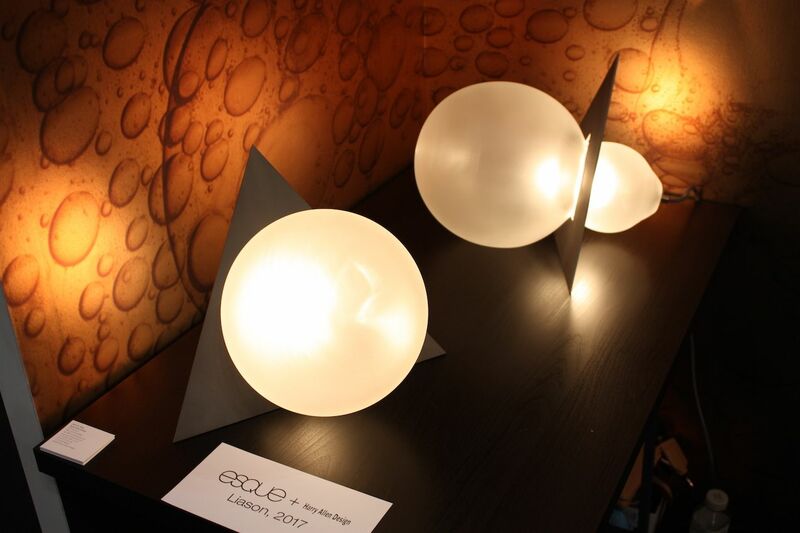 These Eclipse ovoid pendants are another version of his style of design and are rendered in walnut with an acrylic finish. The made-to-order pendants use an LED bulb. From the Formula One racetrack to your living room: London’s Decode Lighting presented these pendants, that were made in collaboration is Hypetex®, the world’s first colored carbon fiber. The light weight of the material allows Decode to scale the fixtures without creating something too heavy. 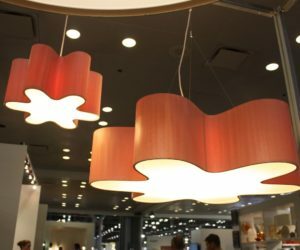 Available in 15 different colors, the thin sheets interlock to form the fixture, allowing light to play in different ways. The Hypetex material was originally developed by Formula One Racing experts. 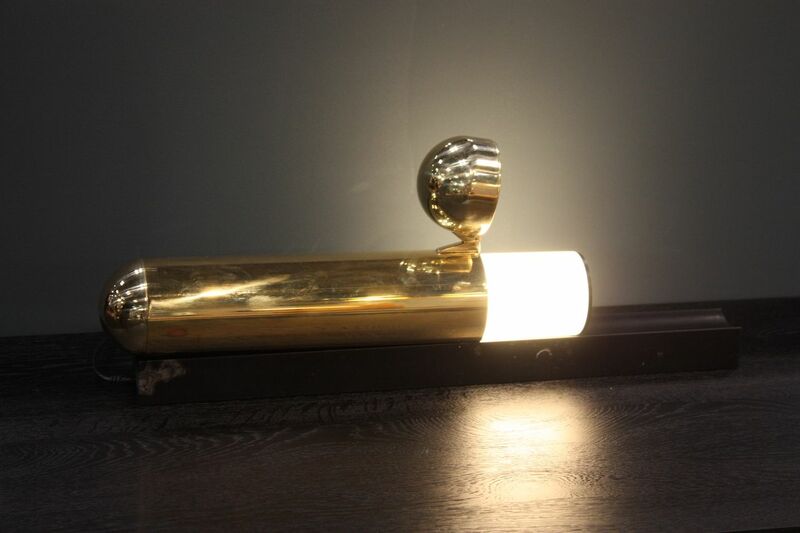 French company CVL Luminaires is known for its high quality brass lighting fixtures and we had a hard time choosing just a couple of highlights. This one is called Earth, and features a delicate burst of a design, however the Earth Collection includes different perforated patterns on these brass disks, which come in various sizes. We fell in love with the pendant version of the Calee Collection and the juxtaposition of the two round forms. The way the larger disk is supported by the smaller copper colored disk is modern and provides interest. CVL writes that this imbalance is key to the design. 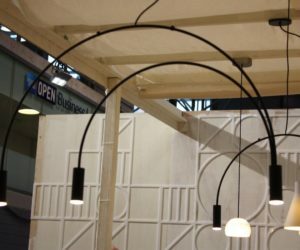 In addition, the cord to the ceiling seem more like an integral part of the fixture and does not detract from its geometry. 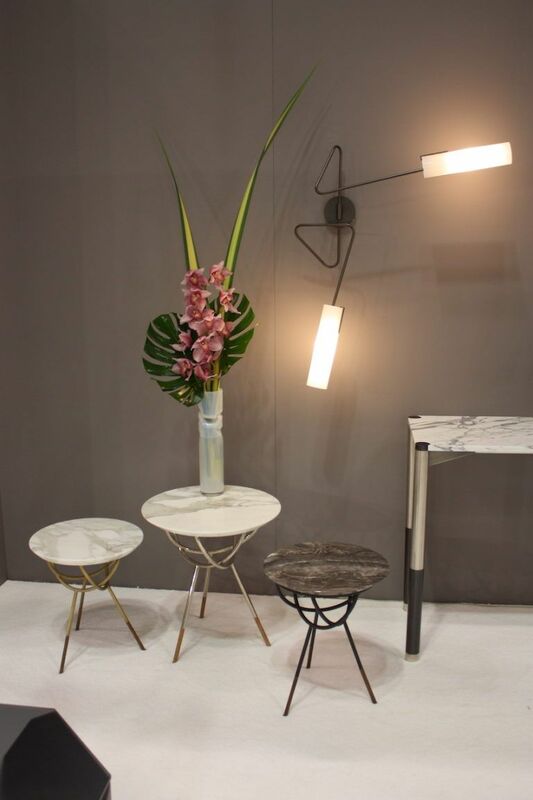 The design is also available as table and floor lamps. 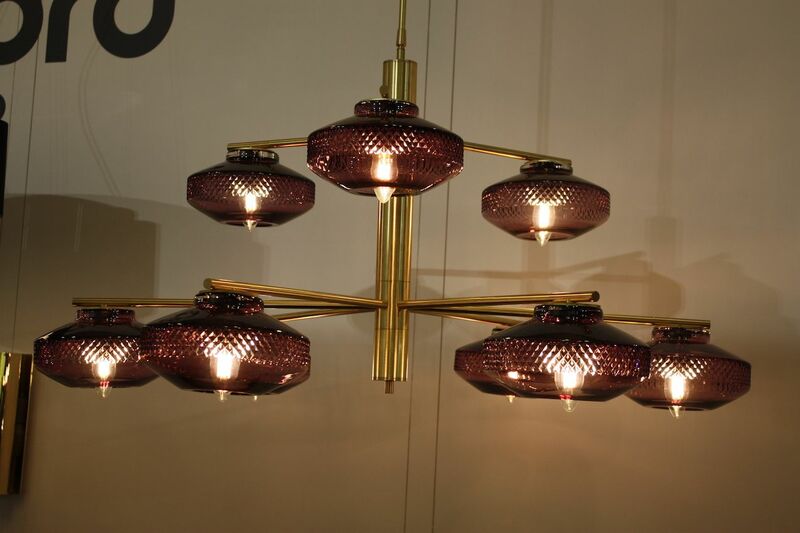 This stunning light creation is from Baguès, Art Lighting a la Francaise. 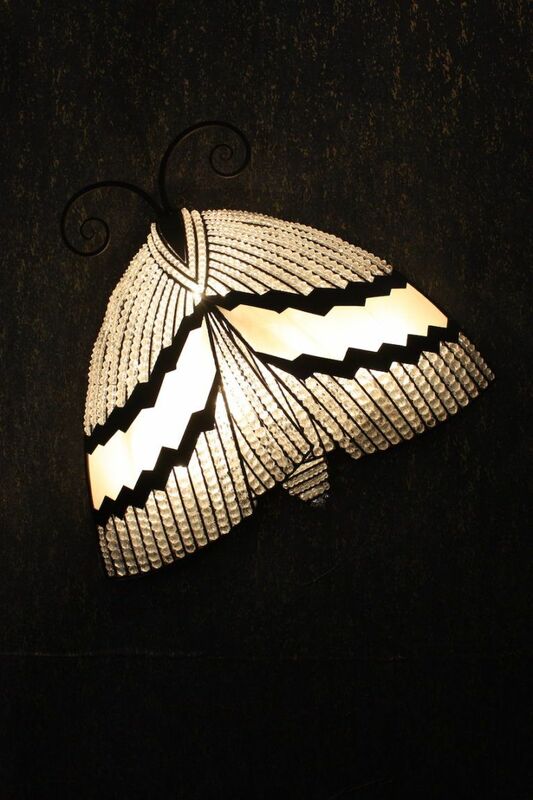 For more than 175 years, the company has been crating spectacular art lighting, like this wall light in the shape of a bejeweled moth. The Art Deco feel of the piece enhances its subtle light It’s a very fitting creature for a mood light — we think — since the moth is most active at night and is itself drawn to a light in darkness. The company got its start with liturgical bronze, evolving into lighting with the general spread of electricity. 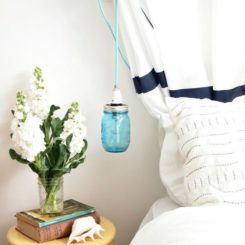 This fun little light is The Float from Brendan Ravenhill Lighting. Inspired by lobster buoys and Japanese fishing floats, the light is comprised of glass leather and rope. 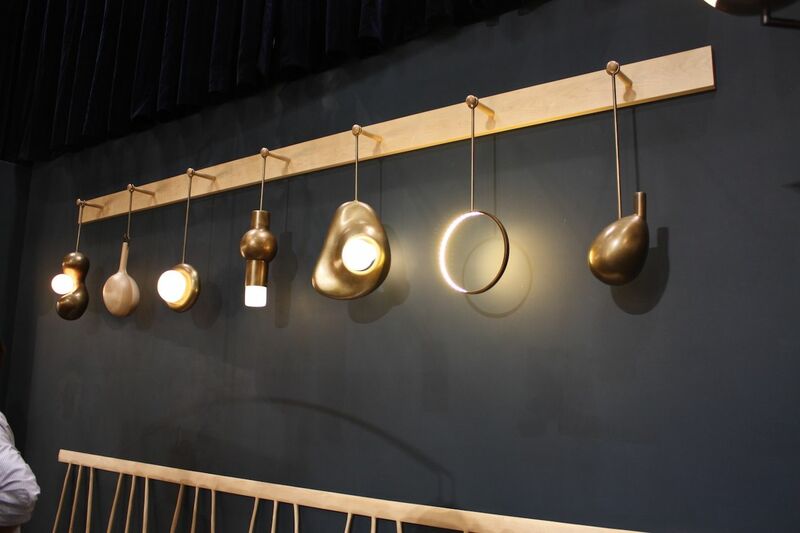 A system of brass hooks allows customers to create groupings of the pendants, arranged however they like. 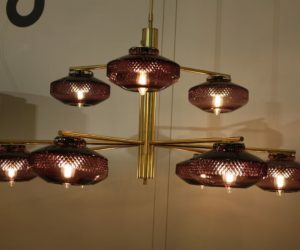 The lighting fixture comes in single, double and triple versions. The piece has a nautical feel, but not overwhelmingly so. Bower’s C Sconce is new and shown in an oil rubbed bronze finish here. 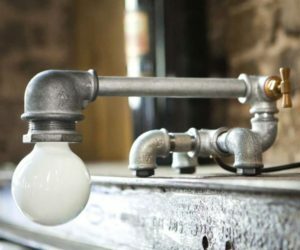 The fixture is made from cold rolled steel, capped off with two, two-inch custom blown globes, illuminated with LED’s. This design is versatile yet would be perfect for giving a bedroom or other space a more masculine feel. The draped tube is stylish and has a casual vibe. 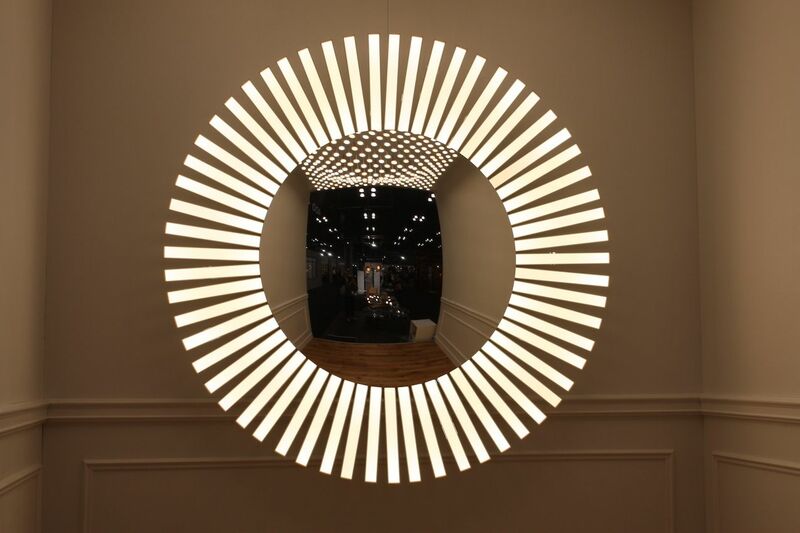 We cold not get enough of the Blackbody OLED booth and its fabulous lights. 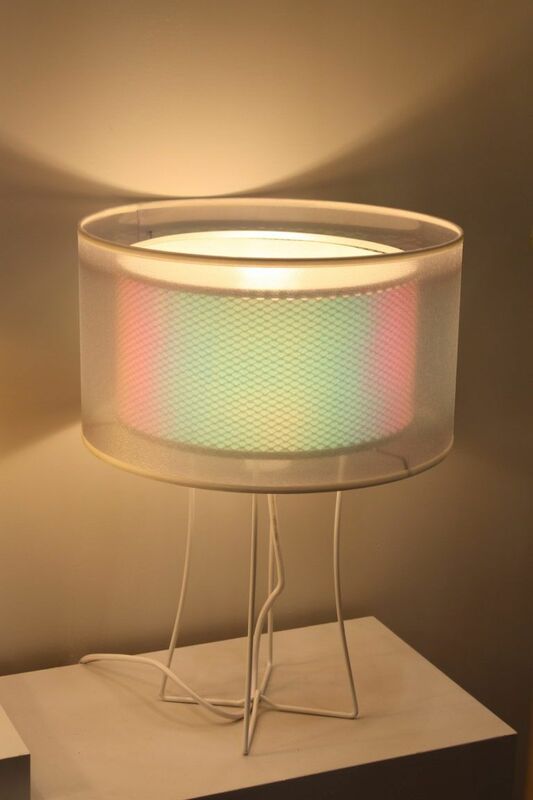 The company focuses on OLED lighting applications, and is a pioneer in the OLED technology that has offering solutions for field such as the automotive industry, aeronautics and medicine. 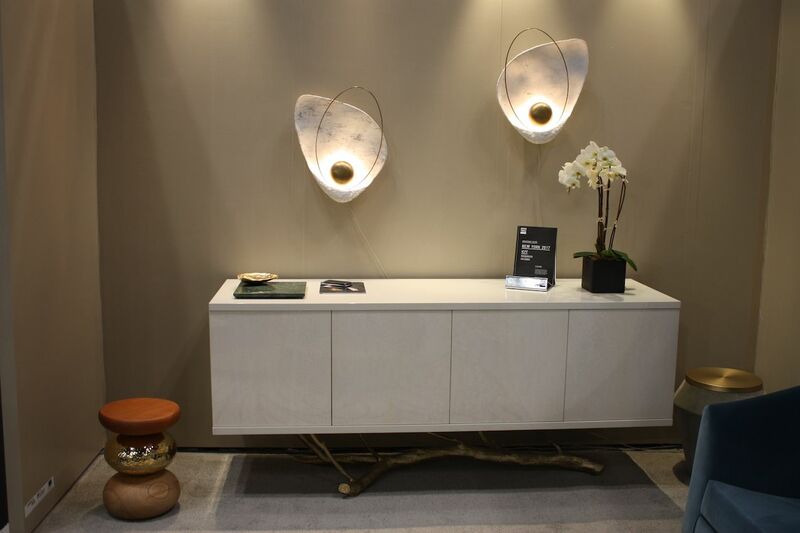 Here the combine the high tech aspect with artful lighting applications such as the Lucky Eye L wall lamp and mirror. 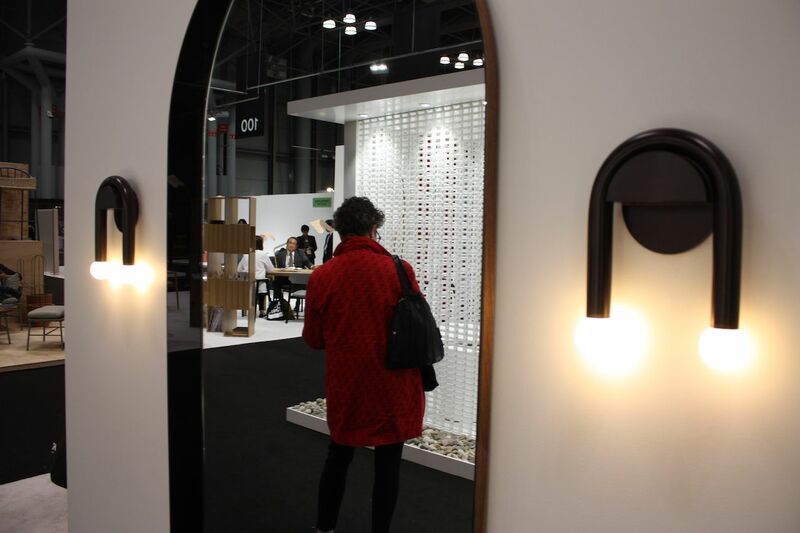 The designers wanted to portray the folklore belief that mirrors bring good luck to their owners. Here, it is surrounded by blazing OLED panels. In the mirror, you can see shower of light from the I Rain fixture on the ceiling. It can have from 37 to 137 lights, or can be customized for larger spaces. The I Rain seen in the mirror comes in several finished including white painted brass, brass, glass, copper, chrome and black nickel. 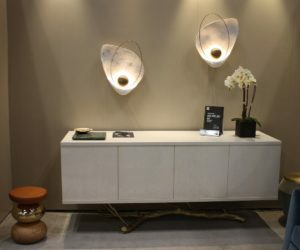 The Barcelona Design Center presented an array of pieces from 13 different designers in Barcelona, including this arced fixture. The minimalist elements holding the lighting elements are suspended from a graceful hemisphere of black metal. Perfect for a modern space but it could fit in a variety of decor styles. 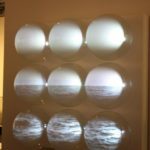 Avram Rusu of Brooklyn has created a wild wall sconce called Continuum, which was inspired by New York street art. 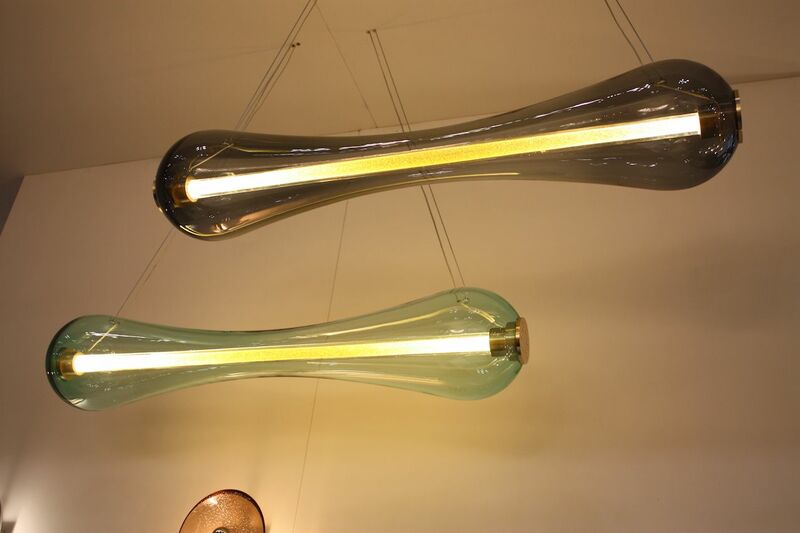 The bent tubes can be arranged in different ways, and the handblown glass shades come in different colors of glass, including and white, aqua, dark and light gray, topaz, and black in a solid or with fading or striping. We love the angular look and the almost haphazard feel that comes form the arrangement of the arms. It comes in ten metal finishes. 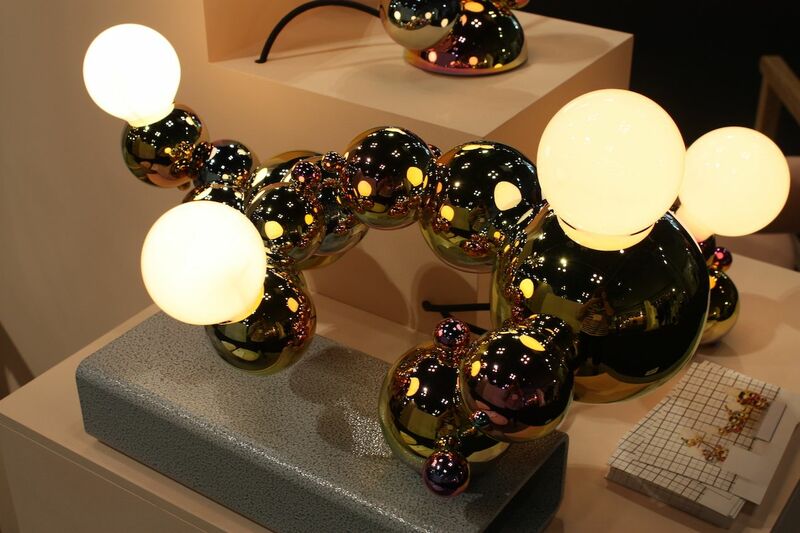 The glass balls in Articolo’s Fitzi wall sconces are magnificent. 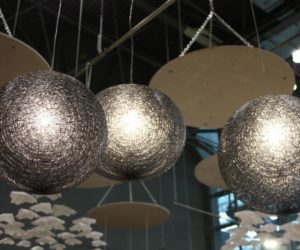 The lighting patterns are different and the metal base seems to have a temporary hold on the ball, as if it is ready to slip off and fly into orbit. The bubbles allow the light to cast amazing patterns on the wall and surroundings. 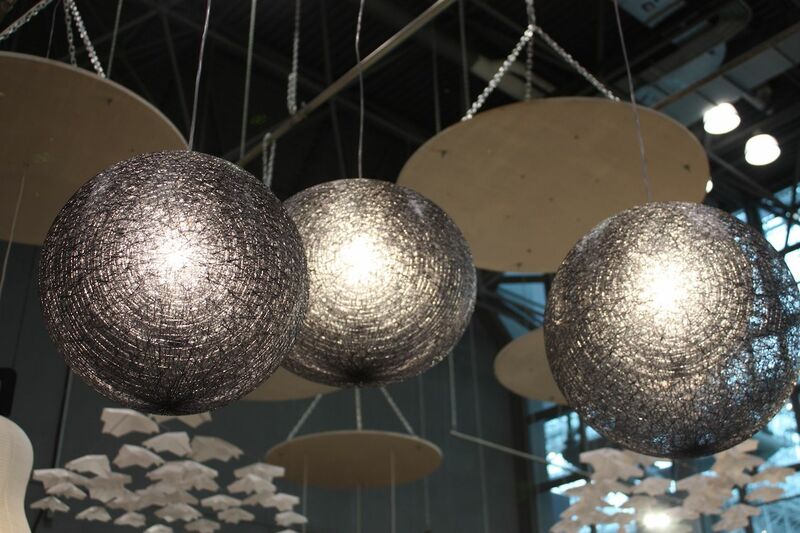 The balls are removable for cleaning and can be customized in multi-drop fixtures. Anna Karlin’s sculptural installation called Glyph is made from cast bronze, wood and metal. The curious fixtures hang from the shaker style peg rack that can be found in countless homes. The way she has elevated a humble utilitarian item into this interesting piece is exceptionally creative. Karlin writes that this piece is meant to draw attention to a forgotten space like a hall or entryway. Her Sun Shade wall light is also distinctive, with its shade removed from the immediate light source. She writes that is is meant to mimic a woman wearing a wide-brimmed hat to shield her face from the wall. The fixture also swivels and the shade rotates, letting you position them however you like or need. The outside of the shade is done in a satin black finish. 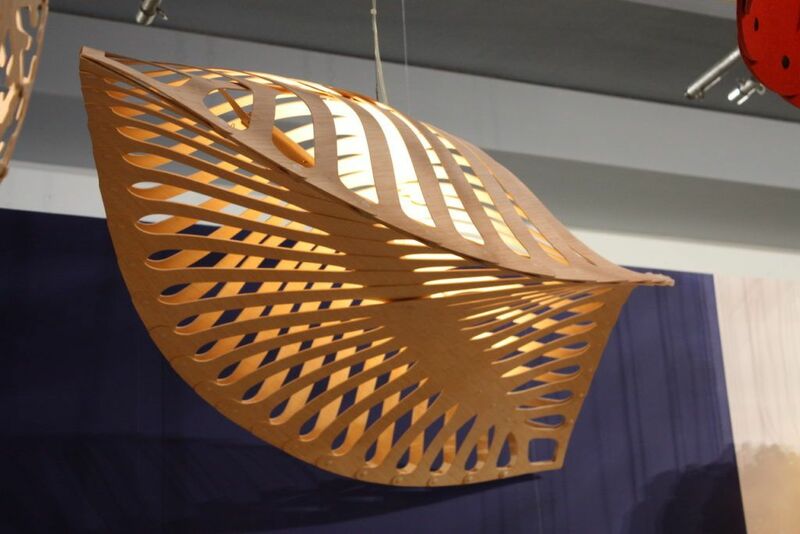 This fixture designed by David Trubridge, from WakaNINE, which we mentioned earlier on, reminds us of a big fat tropical leaf. Actually, it is the Navicula was inspired by microscopic diatoms that float in the oceans and features his distinctive construction style and natural wood finish. This is a nifty piece for adding a touch of nature to any space in your home. The construction of the fixture allows for flat packing. 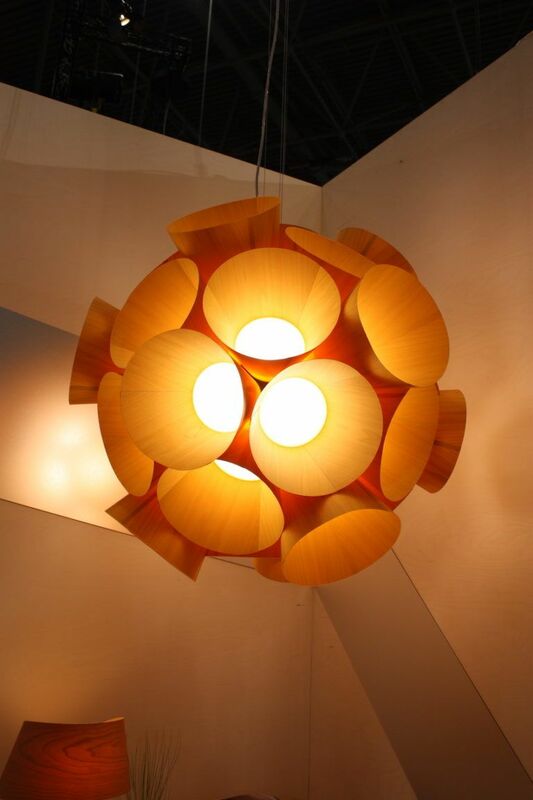 Ameico, based in Connecticut, works with European and Japanese companies to produce its stunning lighting fixtures like this Yamagiwa – Mayuhana Sphere Pendant. Designed by Toyo Ito, it is made of orbs of aluminum and fiberglass that give it a molten appearance. Suckers for great wooden lighting, we couldn’t pass over Ameico’s stunning globe-shaped pendant. 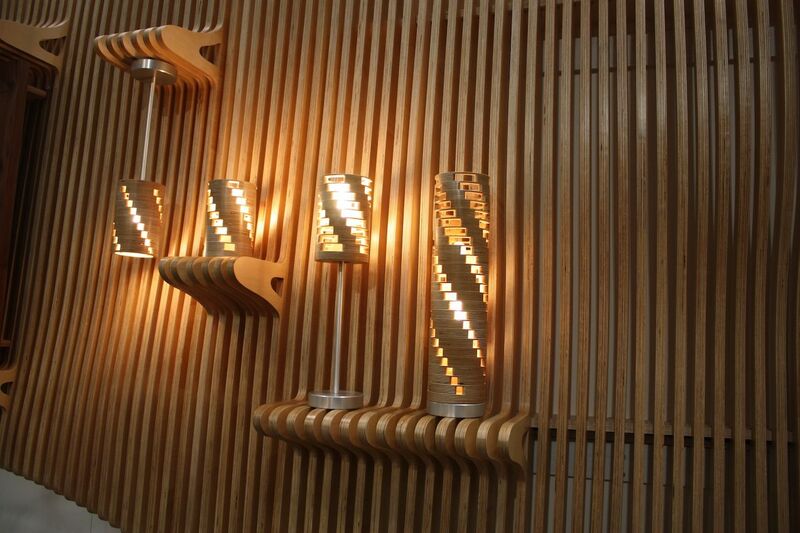 The glowing veneer and the curving lines of the slats make for a gorgeous piece. Gently curving lines provide extra dimension that evokes a feeling of flow. So much lighting, so little time! 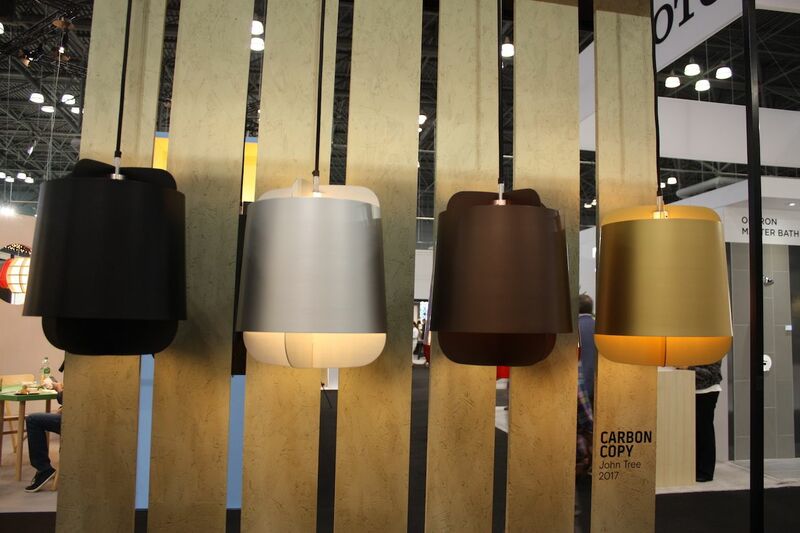 As always, ICFF included an abundant selection of amazing fixtures, made from all sorts of materials, both repurposed and new. The variety reinforces the fact there is no limit to the imagination of designers, and combined with new technologies, we’ll have plenty to look forward to in future editions.